The Torah (in Devarim / Deuteronomy 26:5, Parshat Ki-Tavo) commands the People of Israel to bring the First Fruits of each harvest of the Land of Israel’s Seven Species (Shiv’át ha-Minim) to the Temple as an offering and, together with the Kohen receiving the goods, to recite a formulaic text of thanksgiving that quickly summarizes the ancestral narrative of the People of Israel’s miraculous emergence as a sovereign nation living on its own land. 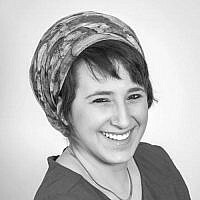 This recitation begins with the words “Arami ovéd avi …” (ארמי אובד אבי). 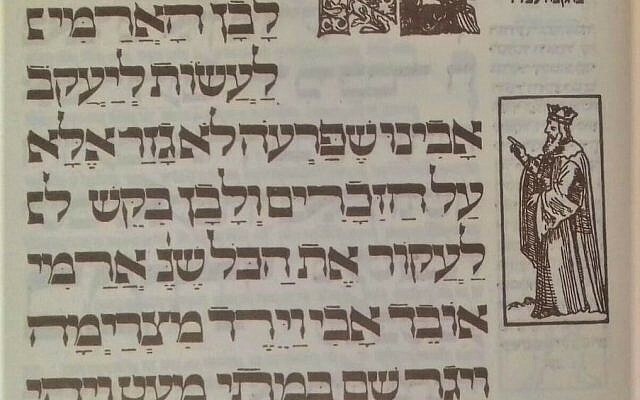 The connection between Pesach and the beginning of the First Fruits cycle may partly explain why this same recitation is quoted in the Haggadah, the text of the Passover Seder. But what do its opening words mean? The Roman-era Targum Onkelos even translated the verse into Aramaic as explicitly stating that “Lavan the Aramaean sought to annihilate the father” (לבן ארמאה בעא לאובדא ית אבא). Several centuries later, Rabbeinu Sa’adia Ga’on as well included explicit mention of Lavan in his classical Arabic translation of the Torah, the Tafsir Rasa”g, stating: לבן אלארמני כאד אן יביד אבי, meaning that Lavan (accidentally called an Armenian instead of an Aramaean) “almost” (كاد ان) brought about the unnamed patriarch’s destruction. So this understanding of the phrase became the mainstream interpretation of the verse in the Rabbinic tradition, and is how the verse was integrated into the Pesach Haggada as well, where it is used to summarize events leading the ancestors of the Israelite nation to seek refuge in Egypt, and miraculously leave Egypt as freed slaves a few generations later: “[…] Lavan sought to uproot the entirety” – to eliminate Israel completely – “as it is said, ‘Arami ovéd avi’ […].” Jewish families have read this interpretation during the Passover Seder for untold generations. 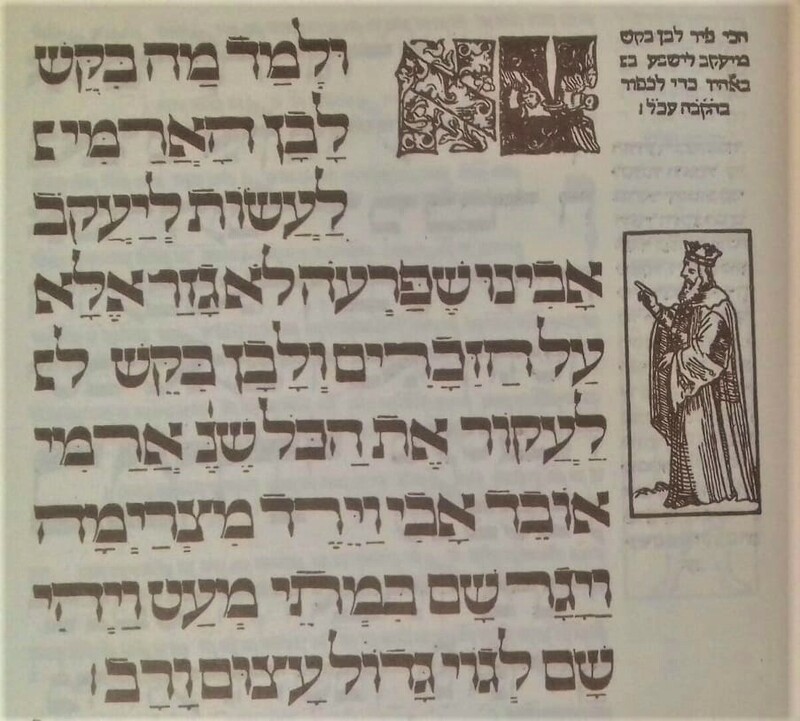 Other interpretations of the verse, included in the Miqra’ot Gedolot editions of the Chumash, read this phrase quite differently, however, and are no less part of Jewish tradition. Ibn Ezra, one of the great Jewish sages of Golden Age Islamic Spain, was adamant: “If ‘Arami’ were referring to Lavan, the Scripture would say ‘ma’avīd’ (מאביד) or ‘me’abbéd’ (מאבד),” both being transitive verbs meaning roughly: to eliminate, annihilate, destroy, cause to perish, render non-existent, to lose, instead of the intransitive verb ovéd (אובד), whose meanings would then be closer to: to be destroyed, to perish oneself, to be lost. 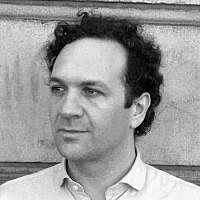 But le’abbéd is normally understood in Hebrew as simply meaning “to lose” something, and the word ovéd / åvád as “to be lost” – of unknown whereabouts, no longer present. It is apparently from this meaning that oved came also to mean “wandering”. At several points in the Tanakh (Hebrew Scriptures), the word “ovéd” is paralleled with nidáh (outcast, נידח), and seems therefore to mean “homeless” or “wanderer”, most famously in Yesha’yahu / Isaiah 27:13, speaking of the exiled Children of Israel: “And the ovǝdīm [אובדים] in the Land of Ashur shall come, and the outcasts [נידחים] who are in the Land of Egypt, […]”, or in Ezekiel / Yehezq’el 34:16: “And I will seek the ovédet, and I will bring back the outcast (nidáhat, נידחת).” In Tehillīm / Psalm 119:95 the connection between ovéd / åvád and wandering is made explicit: Ta’iti ke-séh ovéd (תעיתי כשה אבד), “I wandered like an erring sheep”, which the Rashbam quoted as evidence of his assertion that ovéd is a synonym of to’éh (תועה). Many have therefore translated the verse as saying “My father was a wandering Aramaean”, or something similar. This way of understanding the text is attested already from nearly 2300 years ago, when 70 leading Jewish sages were legendarily asked by Ptolemy Philadelphus, the Hellenistic ruler of Egypt (283-246 BCE) and a key patron of the Alexandria Library, to translate the Tanakh into Greek, beginning with the Torah, and they produced the Septuagint. The Septuagint translates the verse similarly to the much later readings of Ibn Ezra, Sforno and Rashbam, and renders Arami ovéd avi as “Syrian ’apébalen ‘o patér mou” – “My father abandoned Syria” – with “my father” clearly marked as the subject of the sentence (by being in the nominative case: ‘o patér mou), and Syria (Aram) marked as an object of the verb (by being in the accusative case, with the -an suffix). The Septuagint would thus support the Rashbam’s identification of the patriarch in question as Avraham, who was born in Northern Mesopotamia (the area called in Hebrew Arám-Naharáyim – “Aramaea of the Two Rivers” or Paddán-Arám) and left the region to establish his lineage in the future Land of Israel. The verse remains unclear. Even if we understand the Aramaean mentioned as wandering and referring to Ya’aqov Avinu, it is strange to call him an Aramaean, since his family was already living in the Land for generations, and the Canaanite-Hebrew language was his language, as shown at the bilingual naming of the monument marking the truce and border between him and Lavan: the pile of stones was called Gal‘éd (גלעד) in Ya’aqov’s Hebrew and Yegár-Såhadūthå (יגר שהדותא) in Lavan’s Aramaic (Bereishit / Genesis 31:45-54), both meaning “Mound of Witness”. Considering Ya’aqov’s Mesopotamian-born grandfather Avraham to be the wandering Aramaean, as the Rashbam does (and apparently the Septuagint), is also an imperfect solution in light of the rest of the verse, since it is clearly Ya’aqov, not Avraham, who went down to Egypt and became the father of the Israelite nation. It could be that the text is speaking figuratively, saying “my father” when the intended meaning is “our ancestors”, who were Aramaean-origin Semitic semi-nomads driven by famine to seek refuge as foreigners in Egypt, and were even reduced to slavery before they regained their freedom and realized their destiny of becoming a sovereign nation in their own right, on their own land. Just as the Torah often reminds the People of Israel to be kind to strangers who have been forced by circumstances to seek refuge in the Land of Israel, “since you were strangers [גרים] in the Land of Egypt” (Vayiqra / Leviticus 19: 34 being one example), here too there is clearly an educational message. It is worth remembering when coming across the phrase Arami ovéd avi that, though we may have learned to understand it as urging us to guard the memory of a foreigner who threatened the ancestor of the Jewish people with violence, it may actually be reminding us that the founder and namesake of the nation was himself once a wanderer, and a foreigner, even before becoming a refugee in Egypt. And for that reason as well to be all the more thankful for the fruits of our labor and the blessings of living as a free people in our own Land – the double symbol of the Seven Species whose First Fruits were brought to the Temple in ancient times – not out of the memory of ancestral fear, but out of humility and gratitude. 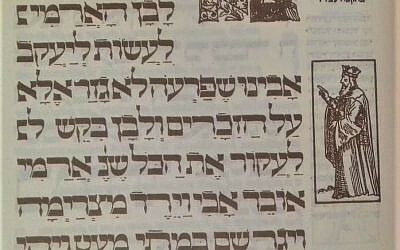 The Haggadah, together with some of the pillars of Jewish tradition (Onkelos, Rashi, Rasag), is nonetheless wary, and though optimistic (reassuring us that in every generation Divine Providence will save the People of Israel from destruction), is seemingly concerned that parting entirely with inherited fears may be a luxury Ya’aqov’s descendants cannot afford. * Traditions differ as to precisely when, but around Pesach the Hanafat ha-‘Omer (“Waving of the [Barley] Sheaf”) ceremony would take place, beginning the 49-day countdown to the holiday of Shavu’ōt. This is still remembered by Jewish communities to this day, with Sefirat ha-‘Omer, the ritual of verbally counting the 49 days linking Pesach with Shavu’ōt. Though traditionally the presentation of the Bikkurim is considered to skip the barley harvest and begin instead on Shavu’ōt, with the wheat harvest, barley is included among the Seven Species (Shiv’at ha-Minim) whose First Fruits were to be brought to the Temple. So the Hanafat ha-‘Omer ceremony, using a sheaf of barley in the center of the Temple ritual at the time of the barley harvest, could be considered as an unofficial start of the yearly Bikkurim cycle. ** Furthermore, As pointed out by Amsterdam-based scholar, researcher and ba’al-qoré Dr. Michael Bloemendal, the Masoretic cantillation marks (ta’amei ha-miqra טעמי המקרא), which also function as an ancient punctuation system, support or reflect this reading, isolating Arami and melding ovéd avi into one semantic unit.